Lamisil Once is a powerful treatment for athlete's foot which requires just one single application. The unique formula penetrates the skin and targets the fungus, continuing to work for days on end until it is eliminated, after just one application. It is a rich soothing cream with a moisturising content which helps very inflamed, dry or cracked skin. Lamisil Once - Requiring just one application, and continuing to work until its target is eliminated, Lamisil Once® has proved to be a powerful cream for the treatment of athlete’s foot. This uniquely rich and soothing cream not only moisturises but also penetrates the skin, working on the dry or cracked areas which have become inflamed. Containing the active ingredient known as terbinafine hydrochloride, this cutaneous solution eliminates fungal infections and yeasts by stopping the production of ergosterol, a substance which is an important component of cell membranes. Lack of ergosterol causes holes to develop in the cell membranes, leading to essential contents of the cells leaking out and unwanted, as well as toxic, compounds entering. It is via these perforations to the cell membrane that allows terbinafine to clear up the infection. As a treatment for athlete’s foot (also known as tinea pedis), Lamisil Once® is readily available in pharmacies. Before applying the solution, you should wash and dry both hands and feet. Even if only one foot appears to be affected, or some skin appears to be unaffected by fungus, take the safeguard of applying Lamisil Once cream to both feet, to be sure that all chances of the existence of fungus have been eliminated. Applying the Lamisil Once both on and between the toes is a good starting point, then move on to covering the sides, top of the foot and also the sole. When finished, the cream should still be visible on the skin, rather than massaged until it has disappeared. Once you have reached this point, feel free to wash your hands but leave Lamisil Once in place on your feet for at least twenty four hours. Showering or bathing could be the ideal time to apply Lamisil Once, allowing the cream to do its work until next day at the same time. 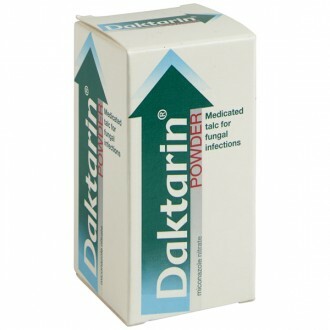 In the meantime, keep your feet as dry as possible and consider using Daktarin Activ fungal powder to dry off any moisture caused through sweating, or any other situation which may lead to moist feet. Terbinafine itself is known to stop the spread of athlete’s foot better and, indeed, more quickly, than other anti-fungal treatments and provides long lasting protection. Lamisil Once offers a convenient alternative to treating with some other creams, as others may need to be applied twice daily for a week or more. Lamisil Once is a powerful treatment for athlete’s foot which requires just one single application. Lamisil Once should be spread quickly and evenly over the whole of both feet and not massaged into the skin. No second application is needed and so the whole content of the tube should be used in this first and only application. Lamisil Once® should dry into a colourless film within two minutes. When you are satisfied that you have successfully applied the cream, wash your hands thoroughly. Only wear socks and shoes when the film has dried. Do not share a tube of Lamisil Once with other people, as the quantity is designed for one use only and sharing could cause cross-infection. The film on your feet will continue working for up to thirteen days from that one application. Improvement should be noticeable within four days, though it could take Lamisil Once up to four weeks to completely rid your feet of the infection. Acrylates / octylacrylamide copolymer, hydroxypropyl cellulose, triglycerides and ethanol. If allergic to any ingredient stated in the product information leaflet or on the packaging, do not use Lamisil Once. Do not use this cream on children or adolescents under 18, since there is insufficient experience of its use on minors. If you have long-term or recurring fungal infections on the soles and / or heels of your feet, which lead to flaky or thickened skin, do not use Lamisil Once. Instead, report this condition to your doctor, who may prescribe a different medicine or treatment. Never use this cream on any skin other than on your feet. If the cream enters your eyes, or is absorbed into an abrasion, it may cause irritation. In the case of open lesions (cuts), the alcohol content of Lamisil Once could cause irritation. In the case of your eyes, rinse thoroughly with clean running water. Should the irritation persist, consult your doctor. Lamisil Once is for external use only and should never be swallowed. Keep safely away from naked flames, as Lamisil Once contains an element of alcohol. When using Lamisil Once on your feet, do not use any other medicine (prescription or non-prescription) or treatment. Before purchase of Lamisil Once, discuss any medication recently taken, including both prescription and non-prescription items, with your doctor or pharmacist. Breast-feeding mothers must not use Lamisil Once, as the active ingredient of terbinafine will be present in breast milk. Please read the product information leaflet, as well as any packaging details, before using any new medication and always inform your doctor of other medications you take or may soon take. What is Lamisil Once used for? 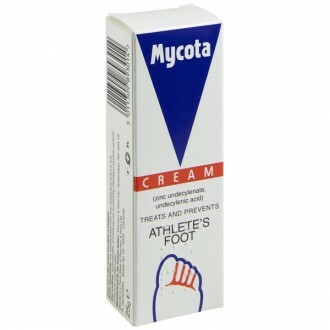 It is an active anti-fungal cream which fights a condition known as athlete's foot (also called tinea pedis). Why should I apply cream to both feet, if only one foot appears to be infected? While it may appear that only one foot is infected, the majority of people find that not treating both feet causes re-infection so, as directed, use Lamisil Once on both feet. Only my toes are infected, so why do I need to apply the cream all over my feet? Though you don’t yet seem to be experiencing the symptoms all over both feet, athlete’s foot could have already started to infect what appears to be clear skin. Treating only the visibly affected areas could mean that the fungal infection may not be fully eliminated, allowing the easy spread or return of the condition. To prevent re-infection, always apply Lamisil Once® as professionally directed. No other treatment is as fast for athlete's foot. Lamisil Once can be applied quickly and easily onto the affected areas and its gentle formula quickly eases the irritation caused by the tinea pedis fungal infection. Where else can I use Lamisil Once? Lamisil Once is for external use only and should therefore only be applied to the outside of the body. Washing your hands thoroughly after application is an important procedure, as not doing so could bring about infecting other parts of your body. Never apply Lamisil Once near your eyes or even touch your eyes, whilst the cream is still on your hands. Should the cream somehow enter your eyes, rinse them thoroughly with clean running water and, if irritation occurs, see your doctor immediately. Is there anything else I can do to support the treatment of the athlete’s foot? Wash your feet and body regularly during the day and be sure to dry yourself well afterwards. Infection can also spread to towels, wash clothes and sponges, bed linen and personal clothing, during the treatment period, so change these regularly. Also, avoid scratching the affected area, as this could transfer the infection to your hands. Once opened, how long does Lamisil Once last? The quantity in each tube is measured for a single application and so contains just enough cream for both feet. How often should Lamisil Once be applied? As its name states, Lamisil Once® need be applied just once as, if applied correctly and to both feet, terbinafine, the active ingredient in Lamisil Once®stays in the skin, and continues fighting the infection, for up to thirteen days. After applying Lamisil Once, when can I take my next shower? For maximum effectiveness, your feet need to remain dry for twenty four hours, which is why you shouldn’t shower before this set time, or indeed involve yourself in any activities which could cause dampness to your feet e.g. any water sports. There are other Lamisil products, so how is Lamisil Once different? Other Lamisil® products require seven days of application for treating athlete's foot. Also, other Lamisilproducts treat other fungal conditions e.g. jock itch and ringworm. As a one day only treatment, Lamisil Once® is recommended for athlete's foot (tinea between the toes) only. Why does Lamisil Once need only one application? Once applied, Lamisil Once® produces a glove-like film which attaches itself to the toes, a film so adhesive, that it doesn’t wash off, even if you use soap and water. This gives terbinafine, the active ingredient, around thirteen days to be absorbed into the foot, before the film finally wears off. When will Lamisil Once make me free from infection? The infection should clear within thirteen days, though damaged skin can take up to a month to heal. Should I take precautions when using Lamisil Once? 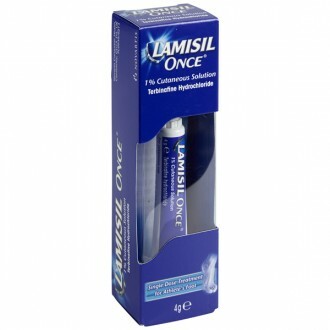 Lamisil Once® is to be used only by people over the age of eighteen and so kept out of the reach of children. Breast-feeding mothers should not use it and users must make sure the cream does not come into contact with their eyes. Should you suffer any reaction when using Lamisil Once®, contact your doctor, so as to ascertain whether you may be allergic to any ingredients. Also, when Lamisil Once has been applied, do not put on socks or shoes, until it has been left to dry for at least a couple of minutes, having allowed it time to make that glove-like film which works at removing the infection. Is athlete’s foot likely to re-occur? Lamisil Once gives protection for up to three months after application. In order to prevent another infection, you need to air your feet properly and keep them fresh and clean at all times. Be diligent about any sweating or moisture on your feet and between your toes, to keep any new infection from re-occurring. Should I go straight for Lamisil Once, or first try a different Lamisil product? Lamisil Once® is specific to athlete's foot and is the Lamisil product that an Express Chemist would recommend for this particular fungal condition. That’s because it’s very easy to use and requires just one single application. However, you could also use Lamisil AT, as it contains the same active ingredient, though you would need to apply it every day. What do I do if Lamisil Once fails to work? If, when applied correctly, Lamisil Once® doesn’t seem to clear the infection of athlete’s foot, speak with your doctor, as you may have a different fungal infection, or there could be a deeper underlying condition. What is the right amount of Lamisil Once cream to apply? Apply the whole tube as, once it is open, it is not designed for keeping. Remember to apply Lamisil Once® to both feet, or you run the risk of maybe not truly clearing the infection. In around eighty percent of cases, both feet fall to this infection and so it is important that you apply Lamisil Once® to the whole of both feet. This should use up all of the cream in the tube.